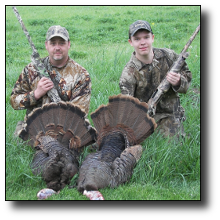 My son Zack and I went out this morning and we both bagged a bird. It is his first time ever turkey hunting. Both were Jakes but none the less, He was "SO" excited! The funny thing is, that just 10 minutes before, I told him that if he killed a turkey with the Benelli, that it would be his! So, now I have to give him the Benelli Supernova that I just bought. Oh well, to see the expression on his face after he knew his bird went down was priceless! "Thank you for making dreams a reality." I have wanted to get my kids involved in hunting for several years now, but I didn't have a safe place to go. Every public state owned area I visited was filled with hunters that had no consideration of others. It was not until I joined the club that I felt comfortable taking my kids in the woods to go hunting. The staff in the office is very gracious and helpful. I would like to thank Angie, Kit, Don and the entire staff for their professionalism and willingness to make this club a success. I look forward for many years of excellent hunting.